Facing the sea, opposite one of the most beautiful beaches in Europe. Newly renovated apartment, unique location. Apartment only the 5th and last floor of a small building. Fantastic terrace of 100m², facing East / South / West, overlooking the bay and the beach of La Baule. Sea views from the living room, bedrooms and kitchen. A lounge / dining room, 2 bedrooms, 1 bathroom, 1 toilet, 1 kitchen. local food market and shops 100m from the apartment. Marina in front of the building. famous sea resort .In summer many cultural, entertainment and sports. International events, horse riding, numerous golf courses, swimming pools and health spas. Many tennis and kitesurf, paddle and sailing schools. - Castel Marie-Louise, La Baule. Front of the Sea and one of the most beautiful beaches of Europe. Recently Renewed apartment, unique location. Only apartment at the 5th and last floor of a building. 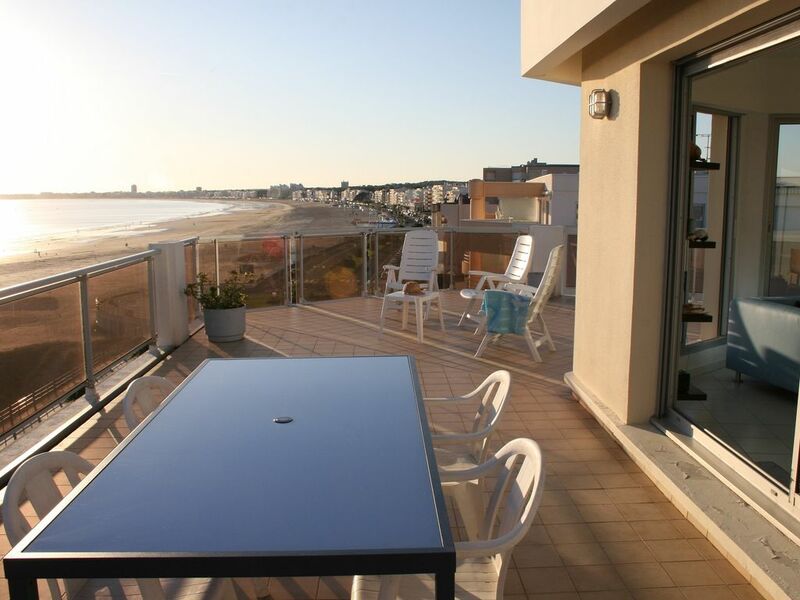 Fantastic terrace of 100m², exposed East / South / West, overhanging the bay and the beach (of La Baule). Sea view from the living room, bedrooms and kitchen. One living / dining room, 2 bedrooms, 1 bathroom, 1 toilet, 1 kitchen. Local food market and shops @ 100m from the apartment. Very renowned sea resort with Numerous summer, cultural activities, shows and sports. International horse riding events, Numerous golf courses, swimming pools and centers of Thalassotherapy. Numerous tennis and kitesurf, paddle and sailing schools. - The Castel Marie-Louise, in La Baule. Désillusions dès notre arrivée , l'annonce avait tout misée sur le balcon immense et surdimensionnés par rapport à l'habitation qui n'offrait qu'une surface ridicule et des prestations déplorables. Pourquoi rester deux semaines dans de telles conditions ? Le descriptif est clair et conforme à l'existant. Chacun l'apprécie à sa façon heureusement. - Round the peninsula by Le Pouliguen, the wild coast, Batz sur Mer, Le Croisic port and around the peninsula, very popular restaurant "Ocean"
- Return possible by the salt marshes from Batz, cross and head towards La Turballe fishing port. - Visit the medieval city of Guérande then continue to Piriac pretty little city by the sea. - Take a walk in Brière by Saint Joachim and go on the island of Fédrun, lunch or dinner at Michelin starred restaurant "the pond birds"
- Walks on the beach, go Benoît beach for pedestrians down the side Baie La Baule, it leads to Pouliguen. - Another ride from the port of Sainte Marguerite Pornichet to the Pointe du Bec and landscaped waterfront. - Further (45 min) The city of Vannes, beautiful medieval town center, possible return by La Roche Bernard and its port on the Vilaine, pretty views. - South of the Loire, cross the bridge of Saint Nazaire and Pornic up, nice little harbor. - Do not forget the markets of Pornichet (Wednesday and Saturday) and La Baule (Tuesday, Friday and Sunday) Strolling De Gaulle Avenue in La Baule. - Where to eat: La Baule, the Barrière group of restaurants, Fouquet's Royal, Eden Beach Hermitage beach restaurant, Castel Marie-Louise starred restaurant. - La Baule, the Seasons, on the beach Benedict held by the head of "The pond birds"
- Pornichet The madness gain 200 m from the apartment, if there are many small restaurants beach or inside.